1. Are your students actively engaged throughout the entirety of your daily lessons? 2. Are students meeting your highest expectations regarding achievement? If you answered ‘no’ to either or both of these questions, you are not alone. Classroom teachers at all levels are challenged with low student engagement, resulting in low student achievement. Numerous studies indicate a positive correlation between engagement and achievement. For this reason, the teacher is the most important component of the learning process, as he/she is ultimately responsible for creating an atmosphere conducive to student achievement. Active Learning has proven to be one of the most important tools for engaging students, promoting skills in motivation, higher-order thinking, communication, creative thinking, and problem-solving. Most teachers agree that these skills are essential for increasing student achievement; however, these skills are difficult to foster in the traditional ‘sage on a stage’ model. 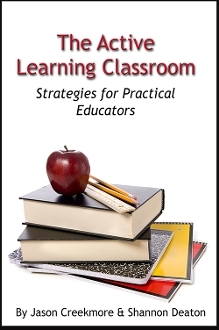 Educators must learn to adopt a new ‘guide on the side’ teaching paradigm whereby traditional instruction is supplemented by active learning strategies. Dr. Jason Creekmore served as a middle grades teacher and principal for thirteen years before moving to higher education. He has presented on a variety of educational issues at regional and national conferences including the Kentucky Center for School Safety (KCSS), Association of Middle Level Education (AMLE), Kentucky Reading Association (KRA), and Mid-South Educational Research Association (MSERA). He currently serves as Program Coordinator for the Master of Arts in Teaching Program at University of the Cumberlands in Williamsburg, KY.
Dr. Shannon Deaton taught middle grades English five years before moving to higher education. He has presented on issues of reading and teacher education at various conferences including the Kentucky Reading Association (KRA), Council for the Accreditation of Educator Preparation (CAEP), Mid-south Educational Research Association (MSERA), and Appalachian College Association (ACA). He currently serves as Associate Dean and Director of the Master of Arts in Teaching Program at University of the Cumberlands in Williamsburg, KY.